A beautifully detailed drawing of a warship from 1728. 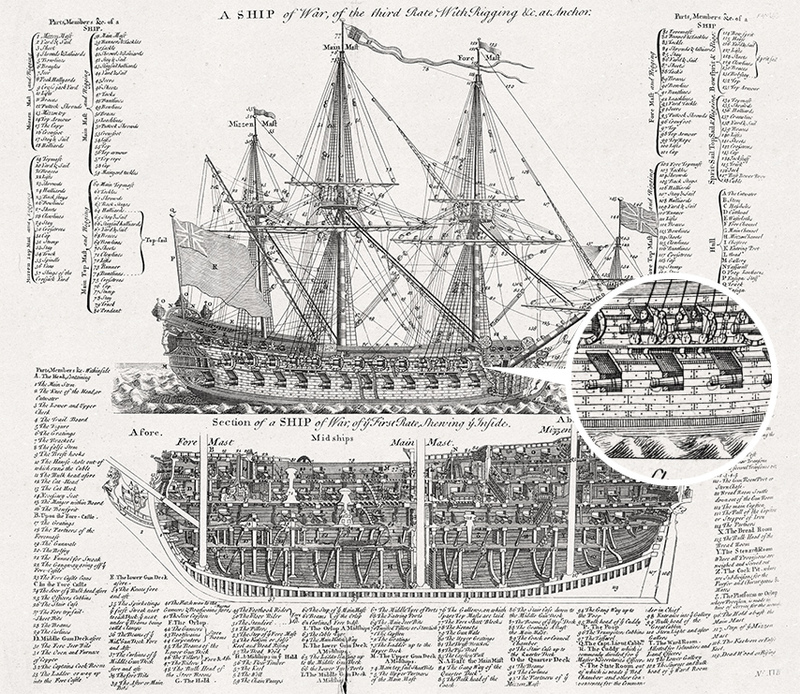 This beautiful diagram and cross section of a warship comes from an encyclopedia from 1728. Specifically, this vessel is a ship of war, of the third rate. From the 17th to 19th centuries, the British Royal Navy conducted war with a naval tactic known as the “line of battle,” where simply two columns of ships would maneuver to bring the largest number of broadside weapons to action. Within this battle style, the Royal Navy built ships of three ratings. A ship of the third rate had 64 and 80 guns mounted to two gun decks on its side. The mechanics and weaponry of first rate and second rate ships were larger and more powerful, but it was known that the third rates had the best compromise of speed and handling, firepower, and cost. A third rate ship would normally carry between 200 and 300 men. Offered here in our standard 11″x14″ size with 2 inch built-in white matte, the photo would look great as a series with our other Free Art Downloads, or as a smaller framed print, perhaps in a hallway or bathroom. All Free Art Downloads have a built in white matte to provide a polished finish once framed. To print, simply bring the file to a place like Staples and have it printed on 11×17 paper. There's a thin black border to act as a cutting reference to get it down to 11×14. Do you know how large might this be able to be scaled? I think I’d like a print of this but maybe at twice the dimensions you suggested in the post. Do you think it would translate to a larger print or might the resolution suffer too much to look any good? Here’s a small sample of it blown up 200% not too bad. It would be great to get these in various desktop sizes to more easily download as wallpapers! Do you know how I could make the background blue? Pardon my ridiculous lack of photoshop skills. BTW, these people are really making quite a profit considering I think it’s exactly the same. While I haven’t tried to do it myself, I imagine in photoshop all it would take is swapping black for blue, and inverting the colors. I’m sure it’s more involved than that simple statement, but if you figure it out, could you let me know? Not a photoshop guy, but have dabbled w/it! I know this is old, but is it possible to do it in black background? Thanks! And the ship is white? If so you can use any editing software and “invert” the colors. Thank you for the prints, Andrew. 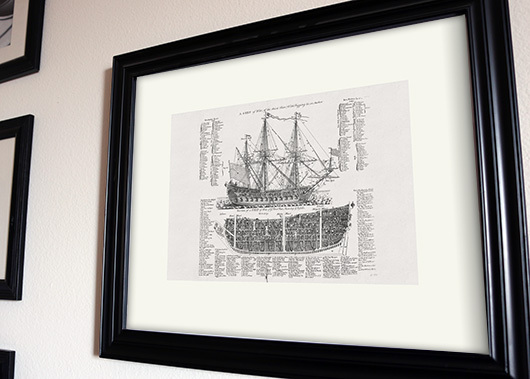 I’ve just recently discovered the Free Art Downloads and printed this ship and the Hemingway one. Got props from the guy at Staples for them. Here is a pic of my office with the new additions. Nice!!! Thanks for sharing the picture, looks great.